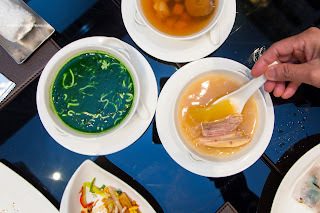 After a day filled with unique and interesting local eats in Macau, we resigned ourselves to generic boring eats in and around our casino resort (The Parisian). In fact, with some credits, we were faced with dining at Le Buffet once again for lunch. 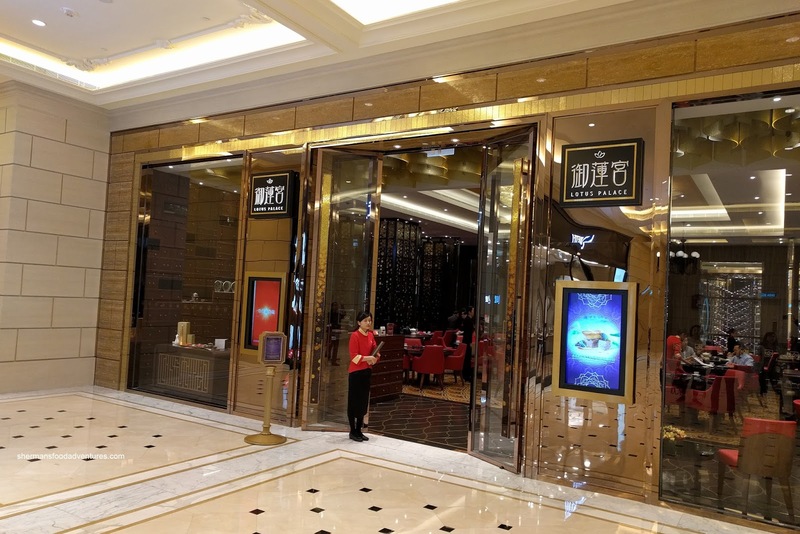 However, one look at the voucher and there were some better options including the resident high-end Chinese restaurant, the opulent-looking Lotus Palace hidden deep within the overwhelming amount of uber-expensive company shops. We weren't expecting much, but hey, the place looked nice. 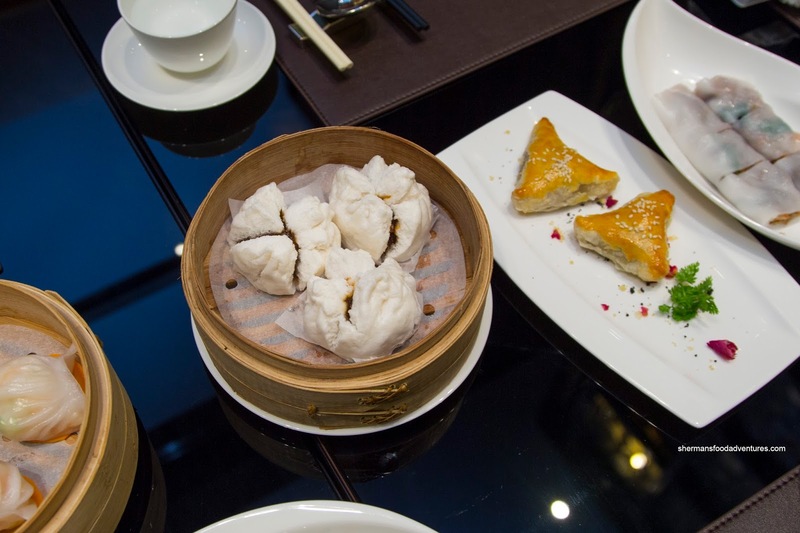 We decided to take advantage of their set lunches which included a selection of eats. 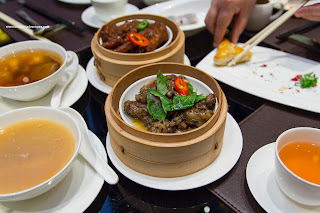 We ended up getting 3 of them and then added a bunch of a la carte Dim Sum items as well. 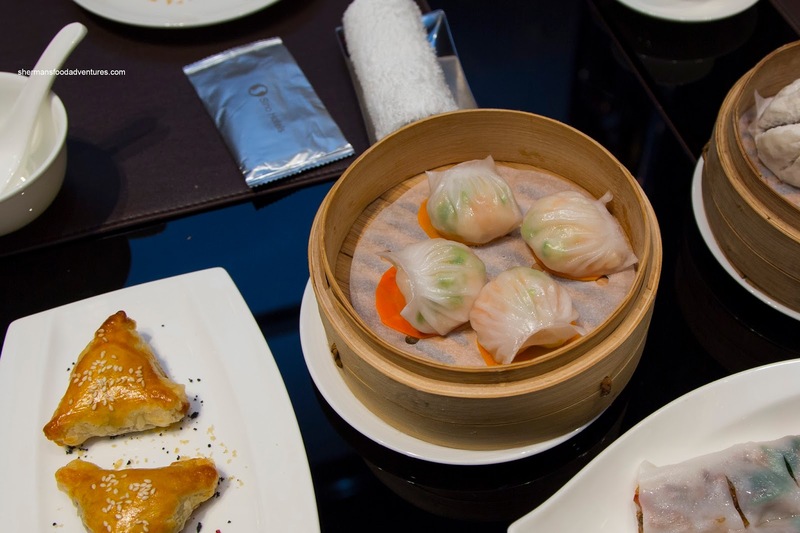 The first to arrive were the requisite Ha Gau (Shrimp Dumplings) and Siu Mai (Pork & Shrimp Dumplings). Okay, any ideas of this place being only a facade was erased by these 2 dishes. 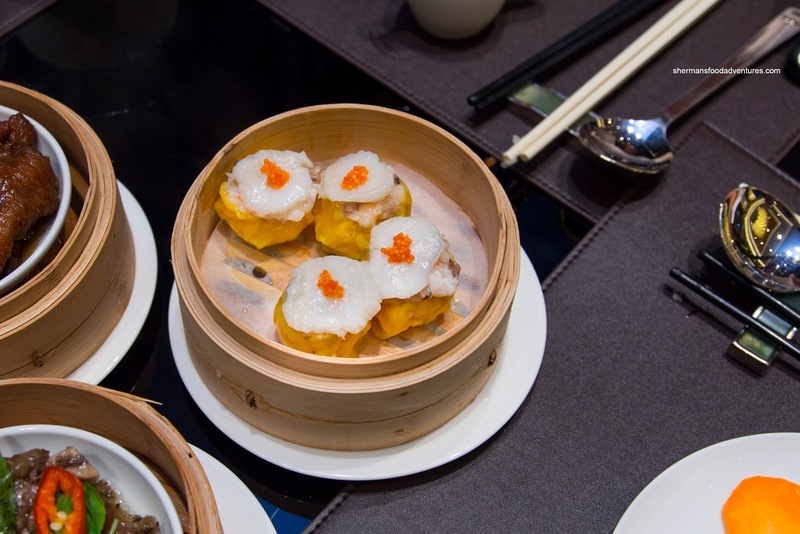 Sporting a thin elastic skin, the large chunks of sweet shrimp were buttery and crunchy. I loved how the bamboo shoots were rinsed properly so that they were no longer pungent. As for the siu mai, there was a good amount of shrimp and shiitake. 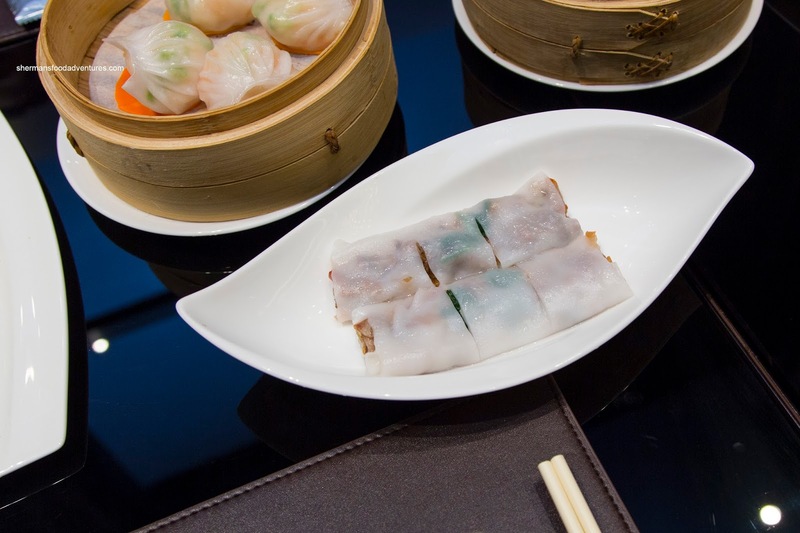 They were packed with flavour while the texture was meaty with a rebound. My son was really happy to see the next 2 dishes arrive. 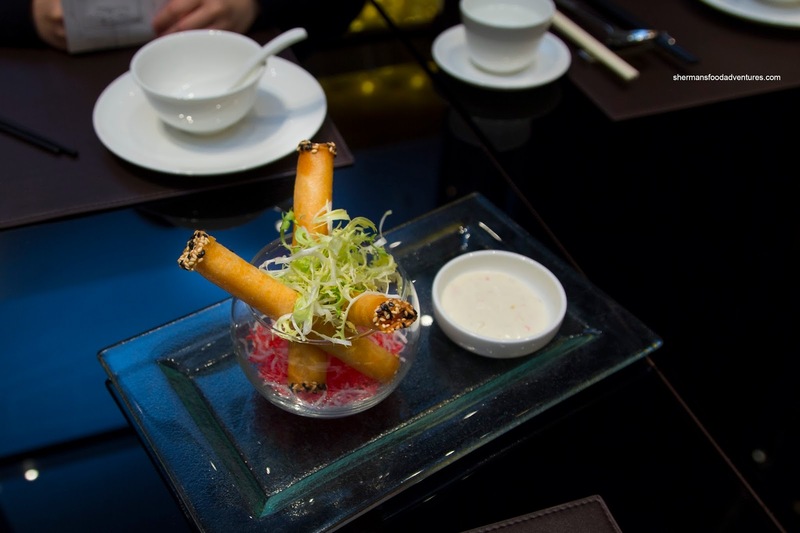 The first was the Shrimp Spring Rolls presented in an interesting, yet not particularly easy to photograph plating. They were thin and crispy with the ends coated in 2 types of sesame seeds. We found them to be easy on the grease inside and out. The shrimp filling was sweet an buttery with an appealing snap. 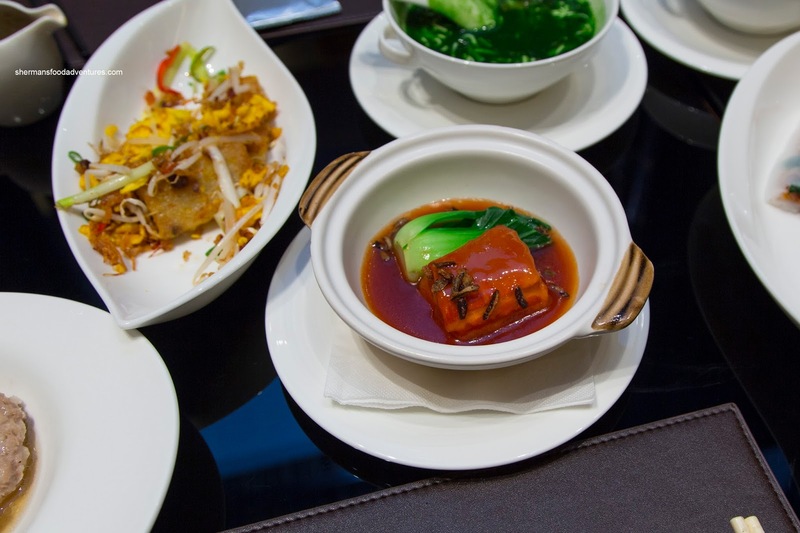 Neatly prepared, the Roast Pork with hoisin and scallions already hidden inside was on point. The thin layer of skin was lightly crispy and almost airy. Underneath, the pork was tender and succulent. Normally, a BBQ Pork Bun is nothing to get excited about, but these ones were on point. Featuring a thin layer of fluffy bun, the whole thing was actually filling which was full of lean pork in a balanced sweet and savoury sauce. As a result, the bun was full of flavour and meaty texture rather than the usual dense version with too much bun. Sporting the same lean filling, the BBQ Pork Pastries were also very good. Somehow, the filling was sweeter and there seemed to be hits of caramelized onion, The pastry itself was buttery and flaky with an appealingly crisp exterior. Still on the BBQ pork theme, we had the BBQ Pork Rice Noodle Roll as well. I really enjoyed the rice noodle as it was thin and almost translucent. It was soft with an elastic rebound texture. Inside, there was no shortage of lean pork mixed with a balanced amount of cilantro. Hence, it wasn't overwhelming. I also loved how they served the side of sweeten soy hot, so that it didn't cool down the rice noodle roll. 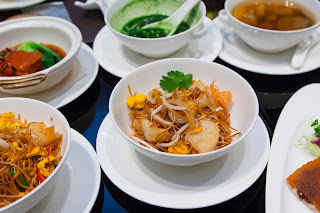 Included with the set meals was the choice of carb, so we chose the Seafood Fried Noodle. As evidenced in the picture, there was much more seafood than noodle. Everything was on point including the chewy noodles that were subjected to proper wok heat. One look at the Phoenix Talons, it was pretty obvious that it wasn't going to be scrawny nor underdone. They appeared to be plump and buttery and with one bite, it was confirmed. 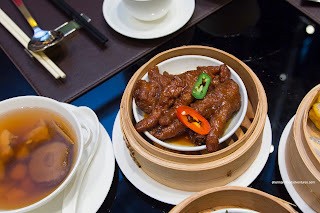 It isn't often that we find chicken feet this plump, but somehow, it seemed like I was eating a substantial amount of food despite the bones. I found the seasoning to be just right bordering on being salty. Prepared with unique flavours, the Basil Beef Short Ribs also teemed of rosemary. Hence, the dish was aromatic and definitely different than the usual black pepper sauce. Texturally, the ribs were appealingly chewy while being tender. With a light egg coating, the XO Daikon Pudding Cake were on point taste and texture-wise. The soft cubes still retained a bite while the daikon flavour came through. 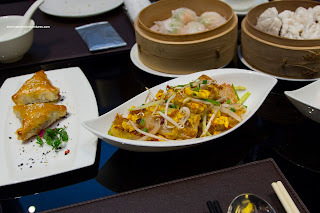 Although there was plenty of XO sauce used in the wok toss, the dish was only mildly spicy where the brininess from the dried shrimp and scallops being at the forefront. Most important of all, the dish was easy on the grease. We also got the Braised Pork Belly as part of the set meal and despite being a bit difficult to cut up, it was ultimately super tender and moist. The fat portion of was buttery and delicious. 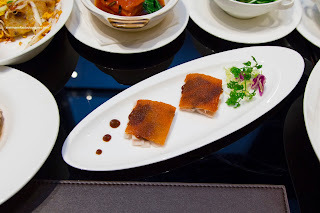 Silky, sweet and only lightly salty, the sauce was a nice match to the mild-tasting pork. 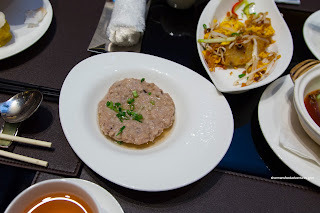 Also part of the set meal, we had the Steamed Pork Patty which was meaty and soft. It wasn't salty nor was it fatty either. It was sweet with a natural pork flavour. Each set meal included a soup, so we chose 3 different ones for variety. The first, Spinach and Crab, was visually stunning in rich deep green hue. It was very mild-tasting with the brightness of spinach. The Chicken & Mushroom Soup featured bits of Virginia ham that added rich saltiness that wasn't overwhleming. The natural sweetness of the chicken was at the forefront as well as the Earthiness of the shiitake. Similarly, the Lo Foh Tong which consisted of chicken, pork and fuzzy melon was also lightly sweet with natural flavours. I liked how they didn't overseasoned the soup and allowed it to stand on its own. From all the dishes we tried, it is pretty clear that Lotus Palace is a legit place to have high-class Dim Sum. 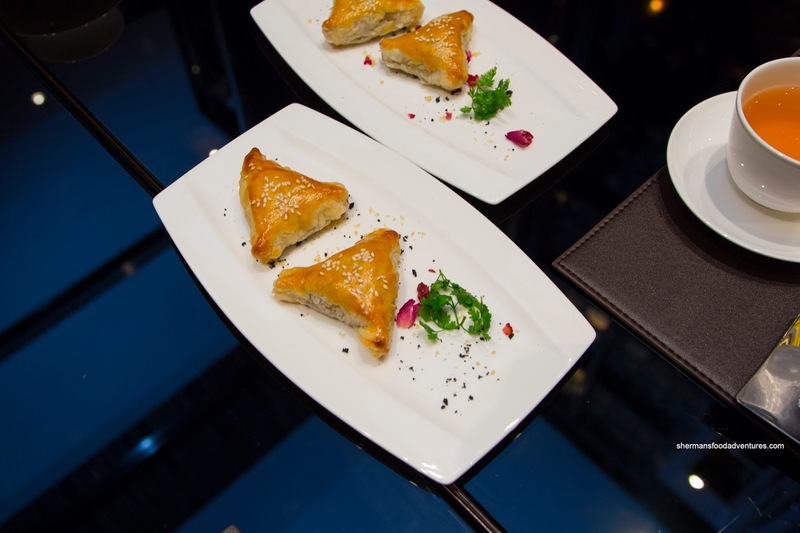 Don't hesitate to try it if you are at the Parisian.